Interactive graphic organizers, 3D graphic organizers, "foldables" - whatever you call them - are a favorite tool of many teachers. I have a love-hate relationship with them myself. I love them when they are used judiciously and with the intent to review or reinforce a concept. I hate them when they are over-used, take the place of an investigation, or become a "craftivity." I love them when they are a relatively quick way to review a concept. I hate them when they become the focus of a lesson. I love them when they are easy to cut out, provide a note-taking or writing experience for students, and are easy to keep in a notebook. I hate them when they include multiple pieces to cut out, intricate designs to cut around, or have lots of little pieces to glue. Activities like this become about the cutting and gluing, and not about the content. I do use them fairly often, I call them content organizers in my classroom, and we use them to organize our thoughts after instruction. My students like to put them in their notebooks. I keep my content organizers simple, They are easy to cut out, very few angles or designs. I also keep them to one piece of paper. Nothing to glue or put together. The only thing we glue is the actual organizer into the notebook. Sometime I ask for color - when the content requires it, but most of the time, not even that is needed. Although I always have some students who like to put color on theirs anyway. I have a number of students who use highlighters and color-coding to help them learn. I also have some student who just like color. I'm certainly ok with that. 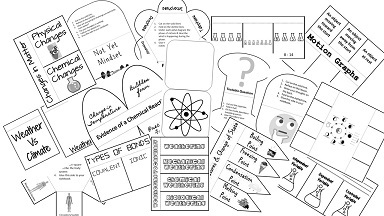 I have created a large number of content organizers, for all branches of science science, plus some generic ones that can be used in multiple ways. I have also made a couple of non-content organizers: mindset, student reflections, etc. I am presenting my organizers and ideas at the Conference for the Advancement of Science Teaching in San Antonio. You can find all of my organizers at this LINK.